In the United States, there are thousands and thousands of total shoulder replacements successfully completed year in and year out for folks who have shoulder arthritis. In some cases, however, this procedure is not very beneficial for those with large rotator cuff tears who have developed a type of shoulder arthritis known as “ rotator cuff tear arthropathy.” For these folks, a traditional total shoulder replacement may result in a lot of pain and limited motion. In these cases, reverse total shoulder replacement may be a better option. The device used in conventional shoulder replacement mimics the normal anatomy and structure of the shoulder: a plastic “disc” is firmly placed into the shoulder socket (glenoid), and a metal “ball” is fixated to the top part of the upper arm bone (humerus). 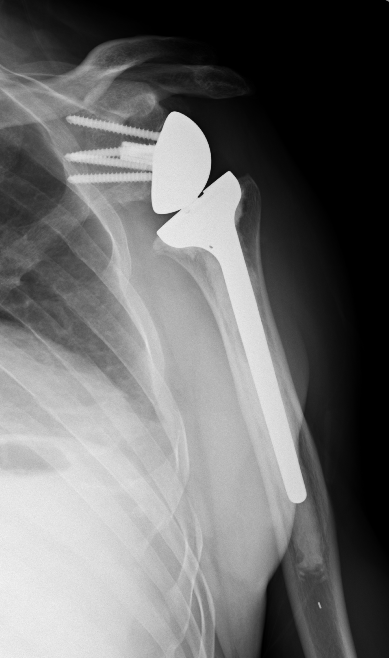 In the case of a reverse total shoulder replacement, the socket and metal ball are reversed. The ball is fitted into the socket while the plastic cup is fixated to the upper part of the humerus. The reason a reverse total shoulder replacement often works better for those with rotator cuff tear arthropathy is because it relies on different muscles to move the arm. In a healthy shoulder under normal circumstances, the muscles of the rotator cuff help position and move the arm to allow for full range of motion. The device used during a conventional shoulder replacement uses the rotator cuff muscles in the same way as a healthy shoulder. When one develops rotator cuff tear arthropathy, these same muscles do not function normally, and often do not function at all. As a result, a reverse total shoulder replacement makes use of the deltoid muscle instead of the rotator cuff in order to power and position the arm. Reverse total shoulder replacement was designed in Europe back in the 1980s, but the FDA (Food and Drug Administration) only approved its use in the United States in 2003. You are advised to wear loose-fitting clothing and a button-up shirt on the day of your procedure. This is recommended because, after surgery, you will be wearing a sling and be unable to use your arm normally. When you are admitted into the hospital on the day of your surgery, you will be taken to the preoperative preparation area where you will meet with a doctor from the anesthesia department. Along with your surgeon, you and your anesthesiologist will discuss the exact type of anesthesia that will be used. You will either be subjected to general anesthetic—where you are completely asleep throughout the duration of the procedure—or a regional anesthetic—where you are awake, but the area of the surgery is numbed. On occasion, you will make use of a combination of the two different anesthetic types. Typically, your surgeon will make an incision on either the front or top of your shoulder. Your surgeon will then remove the damaged bone and replace it with the appropriate components in order to restore shoulder functionality. When you leave the hospital, your arm is going to be supported by a sling. The sling is necessary to protect your shoulder for the first two to four weeks following your procedure. Depending on your exact surgery, your incision wound will be sealed by way of staples or a suture underneath the skin. Staples are removed a few weeks following surgery, but sutures do not require any maintenance afterwards. Until the wound has thoroughly dried and sealed, it is important to refrain from soaking it in water. You will be advised to continually bandage the wound as to avoid irritating it with clothing. As far as home care is concerned, it is important to note that exercise will go a long way in helping you recover. Your surgeon will have developed an exercise plan for you, and it is important that you follow it in order to regain strength. Within two weeks following surgery, most patients are able to perform simple tasks such as eating, dressing themselves, and grooming themselves. There may be a bit of lingering pain that will last for a few weeks. You will have to wait at least two and as many as four or more weeks after surgery before you can drive. Once you have fully recovered from your operation, you should be able to lift your arm above shoulder height and bend your elbow such that you can reach the top of your head or into a cupboard. Reverse shoulder replacement has been heralded for its ability to relieve pain, resulting in incredibly high levels of patient satisfaction. It is also recommended that you take oral antibiotics prior to any future dental appointments to significantly reduce the risk of infection.